Breakout Kings: "Fun with Chemistry"
The Fugitives of the Week were your standard Bonnie and Clyde types with a twist because the female was the dominant of the two, which made the whole ordeal slightly more interesting. As a viewer, I really could have cared less about the bad guys because they were stock cliches that all procedurals use at least once, but I am starting to be entertained by watching the team gel and Lloyd continues to be the selling point. His speech to the husband about survivors guilt was truly impressive. We even got to see what Shea brings to the table, but I could've done without the tired black-on-black tension that's become commonplace. "Chemistry" didn't break the mold, but it did give me a reason to keep coming back. Chuck: "Chuck vs. the Wedding Planner"
As of fan of Chuck, I've always preferred the episodes that focused on the season long story arc and could've done without the stand-alones. Oddly enough, Season 4 has me changing my tune because the stand-alone episodes have been stronger than the ones that have focused on Volkoff and/or Agent X. "Wedding Planner" was one of those rare outings where we didn't get a lot of narrative momentum in regards to the season long story, but it was one of the more entertaining installments of Season 4. It was nice having Sarah's father back, and I'm always up for a good con job, so I was all for this one. Plus, getting more of Sarah's backstory and Casey's family life will always be welcomed. I'm sure the last handfull of episodes will refocus on Volkoff/Agent X, but I wouldn't be opposed to more like "Wedding Planner" before it's all said and done. How I Met Your Mother: "Hopeless"
After the pointless "Exploding Meatball Sub", HIMYM went back to one of its interesting season long stories, Barney's maturation process. "Hopeless" brought back John Lithgow as Barney's father which was already a major upgrade because he and NPH have great chemistry, but we also learned more about him and how his abandonment of Barney impacted his son. We also got another one of those moments where Barney realized that the life he's been leading may not be as glamorous as he once thought. All great stuff. 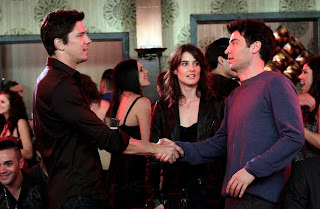 The two side stories, Marshall and Lily getting numbers and Robin and Ted realizing they flirted with other people while dating, were OK but didn't really do much besides introduce Michael Trucco for what will be another pointless relationship for Robin. While I'm still against Robin and Barney getting back together, these random dudes she's being paired with are getting as boring as Ted's non-wife girlfriends. This show needs to figure out what to do with Ted and Robin fast. So, the Barney stuff was aces while the rest of the gang had entertaining albeit unimportant side adventures. ABC finally brought back Cougar Town after a two month plus hiatus, and "Walls" reminded me of what I love and hate about this show. On the positive side, everything that involved Penny Can, Bobby, and, Laurie was beyond great. The zaniness that the Cul-De-Sac Crew brings week in and week out is by far the funniest stuff on TV, and I'm always a big fan of the Bobby/Laurie pairing. One the negative side, Jules continued to be the worst character on television, and her overbearing ways with Travis has never been funny and they still were not amusing during "Walls". Sure, the show's self-aware enough to address her unhealthy relationship with her son, but that didn't change the fact that she's become almost unwatchable. It looks like the writers will be veering away from Jules/Travis for a bit, but that just means she'll switch her attention to Grayson, which is also hard to watch. Once again, this show would be perfect if it was the Crew minus Jules, but I doubt we'll be getting that version any time soon. Even though this week's H50 dealt with undercover cops, crime bosses, and ambitious children trying to take over an empire, the focus was mostly on the fact that Sean Combs was guest starring. As an actor, Diddy was decent, but not enough to overshadow an entire episode, and I cannot remember any real great moments involving the 5-0 team or their dynamics. Overall, "Ho'opa'i" was you by the books episode that relied too much on stunt casting in order to grab for ratings. It wasn't horrible, but it wasn't good either. Glee: "A Night of Neglect"
It's hard to believe that Glee (or FOX) would come back from a two month break and give the fans "A Night of Neglect" because it was by far one of the weakest episodes of the season, and not a good way to remind fans of why they love this show. To be fair, "Neglect" wasn't a horrible episode, but it did not do much in terms of preparing the audience for Nationals, it had a weak plot and uninteresting song choices. I even got the fact that those who were being neglected were characters like Tina and Mercedes, but the writers gave them such horrible story lines that they were done no favors. Luckily, Sue's League of Doom, Mike Chang's sweet moves, and the final appearance of Holly Holliday kept "Neglect" from reaching "Rocky Horror" levels of boring. Modern Family: "Somebody to Watch Over Lily"
While Glee took a stumble this week, Modern Family (its main competition) was as close to perfect as a TV show can get. Like always, the episode focused on three main story lines: Cam and Mitch finding guardians for Lily, Phil and Claire arguing over Luke's well being, and Haley and Alex bonding over acts of vandalism. Sure, they may not sound all that new or exciting, but for the first time in what felt like forever, the show was able to use real family situations for the root of the comedy instead of relying on miscommunication and/or lying as the driving force. "Somebody to Watch Over Lily" was one of the few episodes of the season that didn't feel like a family sitcom but like a comedy about family. Heck, I could even stand Manny and Gloria, so you know it must've been a good one. Cougar Town: "Baby's a Rock 'N' Roller"
We got a Cougar Town two-fer as it reclaimed its post-Modern Family time slot which has been used to give us subpar shows like Mr. Sunshine and Happy Endings (the experiment was a failure). Unfortunately, its return to the old stomping ground wasn't as strong as "Walls". While I did enjoy watching the rare pairing of Laurie and Andy, her main story about regressing back to her slutty ways felt like a huge step back, and it kinda bummed me out. Yes, I know these characters aren't good people, but seeing them make some progress just to have it yanked away felt kind a cheap. Similarly, I loved watching Grayson with Stan, but that whole plot was ruined by Jules and the fact that she doesn't want a kid when he does and she thought giving him a dog would suffice. Man, I hate her so much. The consistent bright spot was the great father/son moments between Bobby and Travis. I still wish we'd get a show just about the guys because that show would be all sorts of awesome. Community: "Paradigms of Human Memory"
I'm sure I've written about how Community comes in multiple flavors before, and how one of the versions of the show focuses way too much on pop culture references which tends to be my least favorite of the bunch. "Paradigms of Human Memory" was one of those episodes, as it was Community's version of a clip show but their spin was they only used new footage versus scenes we've already seen before. 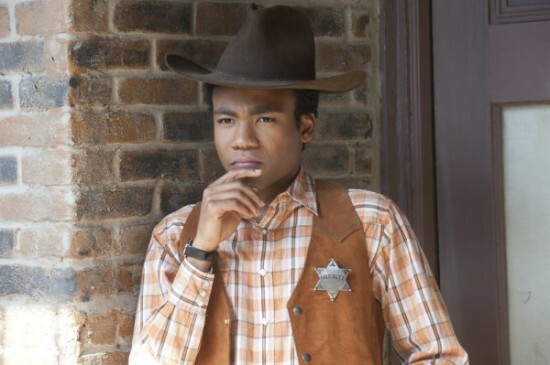 I'll admit "Paradigms" was a creative episode and worked better than it should have, but I didn't feel it actually accomplished anything besides being Community's version of a clip show. We didn't learn anything about the characters that we already didn't know and plot points weren't moved forward. I guess we got a glimpse of how dysfunctional the group is, but it wasn't ground breaking subject matter. Overall, "Human Memory" was just another "wink, wink, nod, nod" episode that has become this show's bread and butter. This week's Nikita continued to explore the new alliance of Nikita, Alex, and Michael, and this time around they were planning faking Alex's death so she could leave Division once and for all. Of course things took an odd turn when she was put on a mission involving Jaden and some nerve toxin. "Girl's Best Friend" had some decent action scenes, but I couldn't muster any emotion for the actual plot mostly because I do not care about Jaden. She's never been an interesting character, so throwing her in the mix at this stage of the game hasn't added anything to the show. The only thing keeping me interested is Michael and how we aren't quite sure who he's playing at this point. 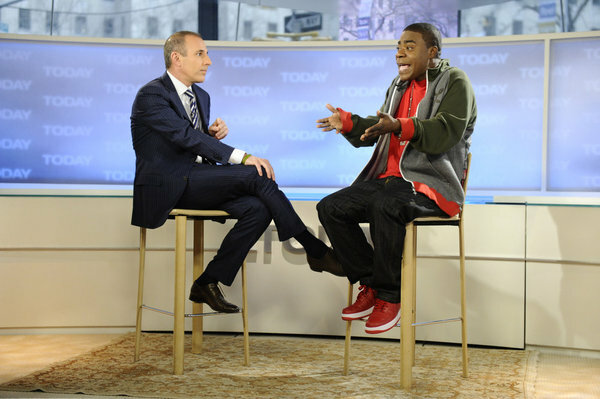 Apparently, Thursday was Clip Show Night on NBC because 30 Rock gave us its more traditional version of the gimmick for its milestone 100th episode. I'll have to admit that I need to re-watch "100" a few times to truly get what was going on because it was too trippy for its own good. I got that the whole gas leak device gave the show an excuse to be even crazier than normal, but it was all over the place that I couldn't quite understand what was going on. Even the usually great Liz/Jack pairing was brought down by the zaniness of the entire episode. I'm sure I'll appreciate "100" more after a few more viewings, but my initial reaction was not too positive. 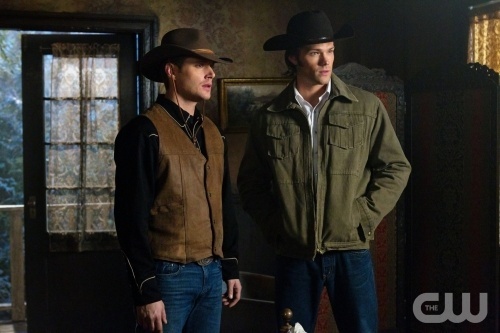 Supernatural works best when it forgoes the Monster of the Week set-up and focuses on the mythology, so I really enjoyed "Frontierland". 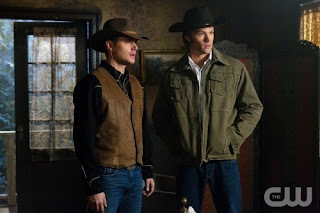 Sure, sending Sam and Dean back to the Old West was a little gimmicky (and excuse to riff on Clint Eastwood, Star Trek, and Back to the Future), but we also got more insight about the War for Heaven, and a tad more information about Eve, so all in all it was a successful episode. My only gripe had to do with the fact that we got two time travel episodes back-to-back. You'd think they would've learned from the events of "My Heart Will Go On", but I digress. NOTE: Still behind on The Vampire Diaries, so it will be off the TV Report Card for the foreseeable future.